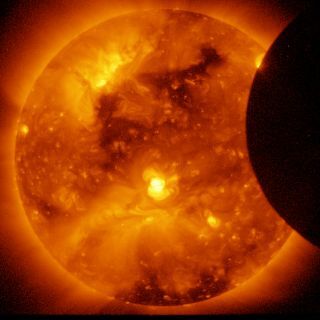 The JAXA/NASA Hinode mission captured this image of an eclipse Jan. 6, 2011. Combining Hinode measurements with those on the ground during a solar eclipse lets researchers track the formation of solar features from the bottom of its outer atmosphere, called the corona. As a solar eclipse researcher, Alphonse Sterling knows the challenges of his work all too well: Even just one cloud can ruin crucial solar readings, and his next opportunity to witness the fleeting event may be years — and thousands of miles — away. Space.com talked with Sterling, a scientist in the solar research group at NASA's Marshall Space Flight Center in Alabama, about one of his research projects for the eclipse and how he's planning for the unpredictable. Space.com: Tell me about what unique data we can get during a solar eclipse. Researchers can get a clear view of the sun's outer atmosphere, called the corona, right? Eclipse views of the corona are really obtainable at this time only in this way, and especially going down to essentially the base of the corona. Space.com: What's the advantage of viewing that part of the sun's outer atmosphere? Sterling: I myself am interested in some features that go on in the very low corona — they start off in the very low corona and the upper chromosphere [the layer of the sun just above the bright "surface" layer, or photosphere], and they stretch into the corona. I want to be able to see how those features interact with the very lowest parts of the corona. What I've been looking at recently are called coronal jets. They're features that become very long and narrow; they shoot out from the sun's lower atmosphere. They're kind of like Old Faithful-type geysers, but on the sun, and it's solar material that's shot up. We've recently recognized that these jets are really miniature versions of larger-scale eruptions in the sun … So we can learn both about larger eruptions by looking at these little guys, and we can also learn about the jets by looking at the larger ones. Space.com: And you'd be comparing eclipse observations with those from satellites focused on the sun at the time. Will you be collecting the ground data yourself? Sterling: It's something that I'm particularly interested in, so I will try to collect my own data and use those first, from the ground — 2 minutes, 20 seconds, that's it. Basically, you need a few good snapshots at appropriate exposure levels that you can combine — much easier said than done. And there are broader data that are going to be collected in other projects. Space.com: I was just about to ask what your plans were and how you'd deal with weather. Sterling: Well… Right. Oh boy. Yes. Right now, I have a reservation in Casper, [Wyoming], but I also have an invitation to something private in eastern Idaho. If the logistics can work out for the Idaho area, I'm going to probably do that, because it will be easier to have more space, for example. I'm going to keep my Casper reservation until as late as I can with the hotel's restrictions. But my restrictions are going to be more than that, because I would have to drive there from Idaho Falls or something, and also, I need time to set up equipment and test things. I need to make a final decision in the few days before the eclipse. But until then, I'll keep both options open. And the thing I've learned about seeing a number of eclipses is, what you do is, you gain a deep appreciation for probability, because your selection is based on the historical records of these places. And if it says 70 percent chance of clear skies, it is what it is, and it's a 30 percent chance that it's not going to be clear. It could be some puff of cloud that decides to come by — it really is a probability game. Space.com: Can you react to incoming weather, as a researcher? Sterling: Back in the day, when I used to only look at eclipses — I did that for the first three — then you have much more mobility, and you can almost literally eclipse chase, or cloudless area chase. But with equipment, it's not that easy. I found that out [on] my first attempt to take data in Ghana, in 2006. I moved at the last minute — at the last hour, literally — with equipment I was not so familiar with yet, and basically, I misused the equipment because of the lack of familiarity and the incredible stress at times just for eclipses. Then, I was unable to relax about eclipse photography until two years later, in China, where I finally was able to photograph it. I determined that in the Ghana one, a mistake I had made was, I had planned to try and look at the back of the camera from totality, to be sure that I was taking the picture. And when I looked through the eyepiece to do an adjustment mideclipse, the sun had moved off. What must have been doing was, I was sighting along the side of the telescope, looking at real totality, and thinking that I was actually looking at totality in the back of the camera. And so, in [China's] Gansu province in 2008, I made up my mind that I did not even want to see the eclipse. I turned my back to it, and I only looked at the back of the camera. So I missed that eclipse, but I have the photographs. Finally, redemption. Space.com: Did that get the worry out of your system? Or are you doing that again this time? Sterling: [I'll be using] different equipment, and I still watch it pretty closely. But now, after some last checks… In Indonesia last year, I did have the setup automated. I did some last checks that I had planned to do in the minutes leading up to totality, and then at the start of totality, I verified that the system was working — and then I was able to just forget about it for the short minutes of totality and just enjoy that. It was through thin clouds, but we could see it. The data weren't of the quality that I wanted, but I was able to enjoy the visual experience. Space.com: If the weather were to change, would you adapt the data you wanted to collect? Sterling: I would adapt a little bit. I would adapt probably in the exposures I would set to use to observe the eclipse, because if there are thin clouds, then a longer exposure just tends to scatter the light rather than let you see the outer corona. Before eclipse day, I plan to have a second program in case of a thin-cloud situation.